Mammoth Lakes, a place made for creating memories for you, your family and your grandchildren - on our ski runs, on our biking trails, or during a stroll down Main Street. 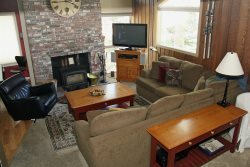 Mammoth Lakes Lodging offers a wide assortment of accommodation types that are sure to meet the needs of any single, couple, group, or family visiting the beautiful Eastern Sierra area. Where are the best places to stay in Mammoth Lakes? We have listed our Mammoth Ski Resort Communities below. These include locations throughout town, in the scenic meadow area, near Mammoth Lakes golf and near Mammoth Lakes Ski lifts. Click on the links below to see the details of the Mammoth Vacation Rentals available through Central Reservations of Mammoth to start planning your new memories. We hope this helps you with your unit selection. Should you have additional questions or need more information than what is provided here please phone one of our friendly reservationists at 800-321-3261. It does not matter which season you choose to enjoy, our Condominium, Townhome and Vacation Home Rentals are centrally located throughout the Mammoth Resort so you can choose to Stay Where You Play and conveniently enjoy all Mammoth Lakes has to offer. A small quiet complex located close to the green line shuttle to Little Eagle. Close to Sierra Star Golf Course. Just a 5 min drive to groceries, restaurants, Vons and shopping.